Q: I am following your burnt edge tutorial and have been able to get the steps up until the photo shows through after creating the black box around the edges. When I deselect, the photo does not show through like it is supposed to do according to the instructions. Any help is greatly appreciated. Thanks for trying my Burnt Edge Effect Tutorial. The most likely cause for the photo not showing through is because the Foreground Color was set to White instead of Black when you pressed Alt-Backspace(Mac:Option-Delete) to fill the Layer Mask with black in Step 3. If that's the case you can easily change them around by pressing the letter X on your keyboard. 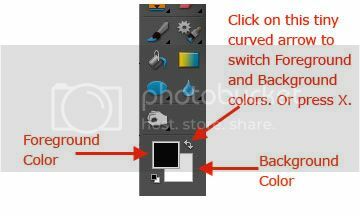 Bottom line is you need to make sure your Foreground Color is set to Black before pressing Alt-Backspace(Mac:Option-Delete). Give that a try and use the post a comment link below to let us know if it worked.